In 2016, the humble stethoscope enters its 200th year as the most ubiquitous diagnostic tool in medicine. In recent years, Ultrasound technology has become increasingly adopted at the point of care, adding vision to sound at the medical front line. 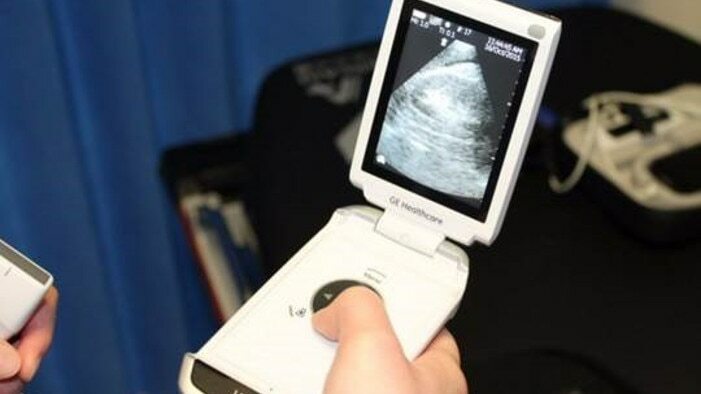 Now, King’s College Hospital has become the first hospital in the UK to trial the use of a pocket-sized ultrasound device, called the Vscan with Dual Probe, alongside the traditional stethoscope when teaching medical students. Vscan, developed by GE Healthcare, is about the size of a smartphone and provides basic ultrasound capabilities to look inside the body. Some models of the Vscan, like the one used at KCL, come with a ‘dual probe’, meaning they can perform shallow scans as well as deeper scans of body tissue, useful to visualize everything from a broken wrist to a cardiac arrest. The device has previously been hailed as a solution for remote, resource-constrained healthcare settings around the world, where the device overcomes barriers like cost, size, and power (the device runs on its own power source). Yet it has also proven to be an indispensable tool for doctors much closer to home, where they are used to quickly and easily evaluate patients. Just as smartphones now have as much power as laptops ten years ago, Vscan offers excellent ultrasound quality at a fraction of the size (and cost) of older conventional machines. Undergraduates at the south London hospital’s Emergency Department are using Vscan to learn the importance of combining sounds and images when making a diagnosis. Although medics have been using ultrasound machines for many years, handheld devices are now being issued to medical students to support their clinical assessments. Under the supervision of a physician, the Vscan devices are helping students to diagnose a range of serious conditions including abnormal fluid in the chest, bleeding in the abdomen and undiagnosed heart conditions. Some are even wondering why clinicians still use stethoscopes, but Dr Abu-Habsa is confident they won’t be phased out for a while yet. “The stethoscope is a valuable tool to a physician. Although it won’t become entirely redundant, we need to combine its use with emerging technology so we are using the most efficient tools, fit for modern-day medicine,” he said.